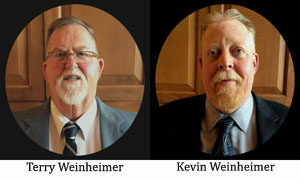 Kevin Weinheimer and Terry Weinheimer of The Weinheimer Group are nationally respected Floor Covering Experts. As floor covering consultants and certified floor covering inspectors they investigate, perform testing, provide research and solve floor covering problems. When you need a recognized expert to solve a flooring or floor covering problem, Kevin and Terry are the experts you have been searching for. In 1934 James H. Weinheimer left his position as a chemical company chemist and entered the floor covering service industry, later expanding into wholesale, contract and retail floor covering sales. While still in college, Terry was to join the company. In 1990, Terry moved his family to Oregon, where he started a floor covering inspection company. In 1998, Kevin became certified and joined Terry. Today, The Weinheimer Group serves clients throughout the pacific northwest. The Weinheimer’s are experts at preventing floor covering problems, identifying the cause of a flooring problems and claims resolution. Our services are available for most floor covering products including carpet, laminate, hardwood, vinyl, LVT, VCT, linoleum, cork, concrete and most other flooring materials and installation systems. After thorough analysis, we determine if the flooring or floor covering problem is product related, an installation error, site related, normal characteristic, improper specification, or other condition. Home owners, construction companies, retailers, manufactured home builders, fiber companies, floor covering manufacturers, wholesale distributors, insurance companies, attorneys and others. If you have a floor covering concern, The Weinheimer Group is available to assist. As a way of saying thank you for the success that the floor covering industry has brought to our family, The Weinheimer Group host informational websites. These websites include Laminate Floor Problems, Carpets Wall to Wall and Floor Central. At these sites, we discuss flooring problems, how to identify them, and how to solve many floor covering problems. We service the state of Oregon, Washington and portions of northwest California. We are available for nationwide service and are prepared to travel anywhere in the world upon client requests. Service Area Click Here. For more information about the Weinheimer Group or to arrange for our services, contact us.